If you are interested in purchasing or selling a part, or are looking for a part not listed, please contact me at ccstinger@gmail.com. 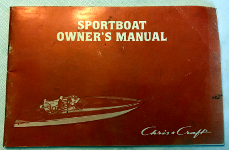 Original Chris-Craft sportboat owner's manual. Includes chapters titled "Congratulations", "Warranty", "Safety Afloat", "Weather", "Boater's Float Plan", "High Performance Boats", "Accidents", "Fueling", "Starting", "Basic Boat Handling at a Dock", "Loading", "Check Points for Peak Performance", "Controls", "Maintenance/Repair", "Trailering", and "Water Skiing". Manual shows some fading and creasing on cover, no marks in interior. 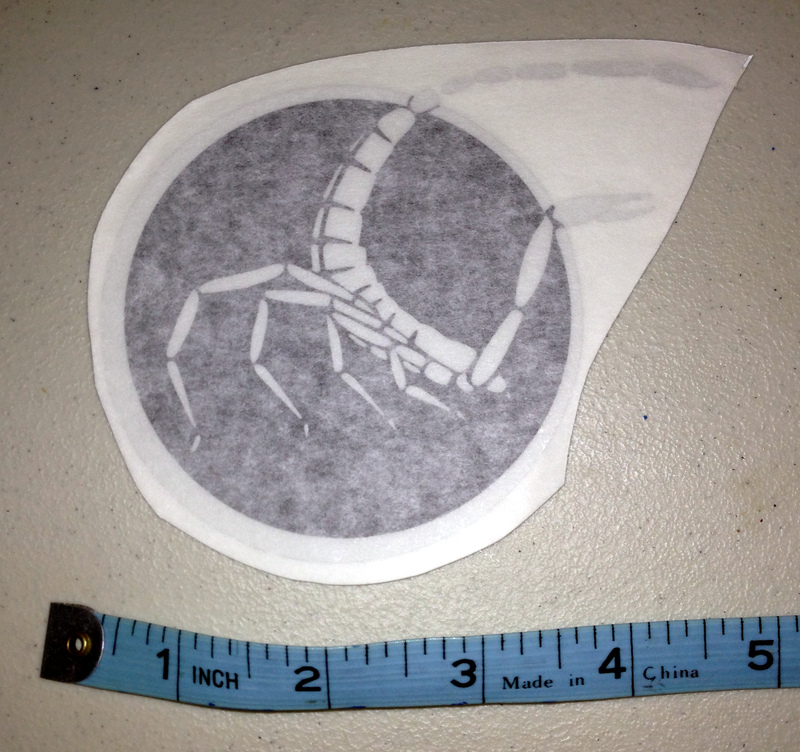 Vinyl reproduction Stinger decals. Approximately 5" x 4". Reproduced from an original decal from a 1984 Stinger 312. Black with chrome. 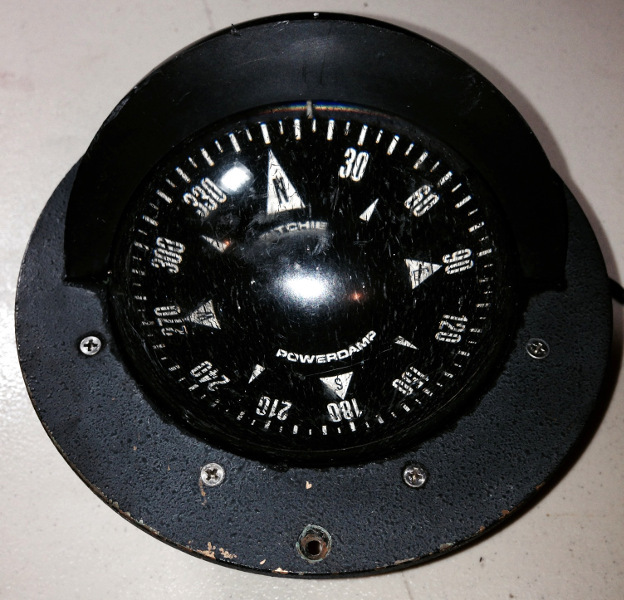 Original compass from a 1984 Stinger 260. This is a used item and shows wear including marks on the glass. Light works. These emblems are new-old-stock items. They are made of plastic and plated in foil which is painted. Black paint on some of the emblems has peeled and will need to be repainted. The original unused adhesive is on the back side of the emblems. 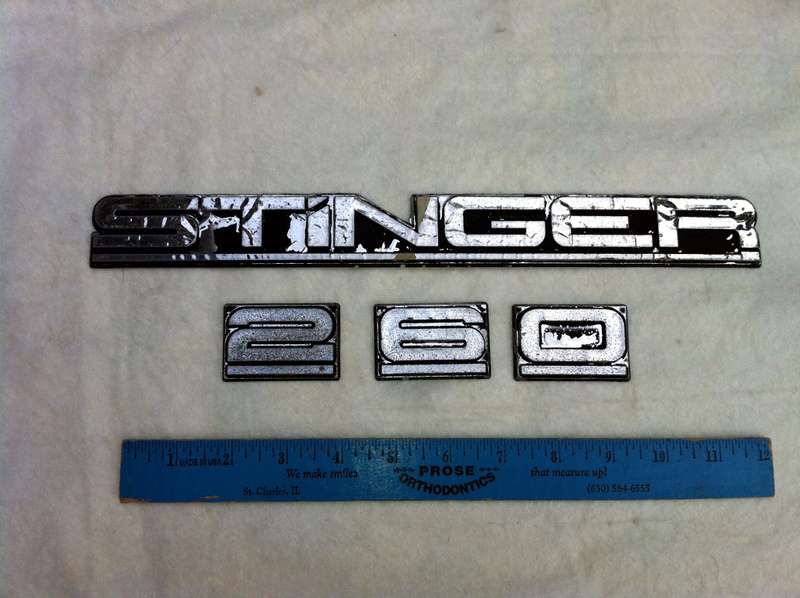 This emblem came off of a later model 260 Stinger. The emblem is in good shape. It is made of a plastic material plated with a foil type material. This emblem came off of a 1987 260 Stinger. The emblem is in poor shape. It is made of a plastic material plated with a foil type material. In places the foil was painted black. The emblem was mounted to the boat with adhesive. The foil is separating from the underlying plastic. 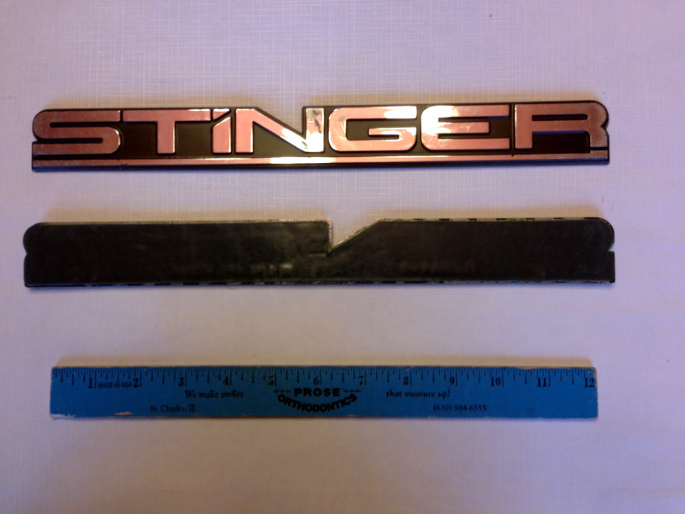 Original trim panel for a 1986 Chris Craft 260 Stinger. This is a used item that shows some wear. Wear includes faded color and discoloration/stain marks. In addition, the bottom of the panel had been notched out (1/8") and two hole drilled for what looks like an instrument mounting. Original trim panel from a 1984 Chris Craft 260 Stinger. This is a used item that shows some wear. Wear includes faded color and discoloration/stain marks. 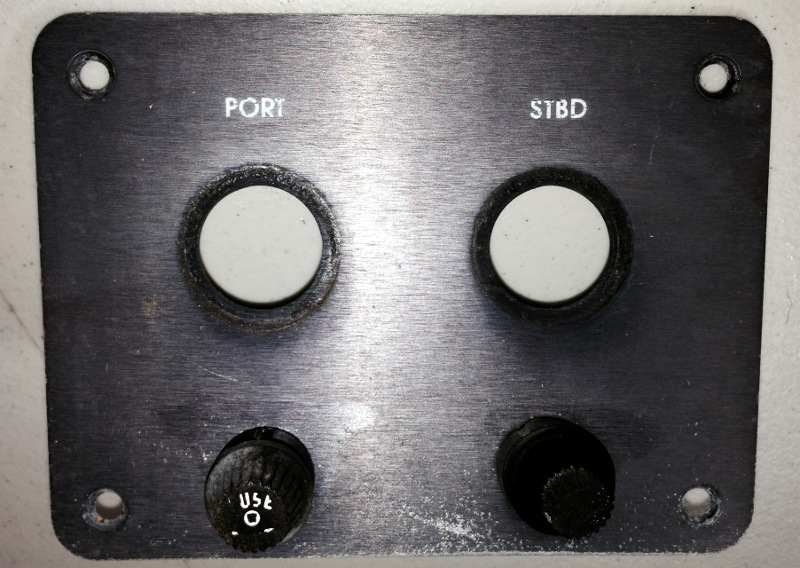 Original switch and indicator panel from a 1984 Chris-Craft 260 Stinger. This is a used item that shows some wear. All but three indicator lights work. 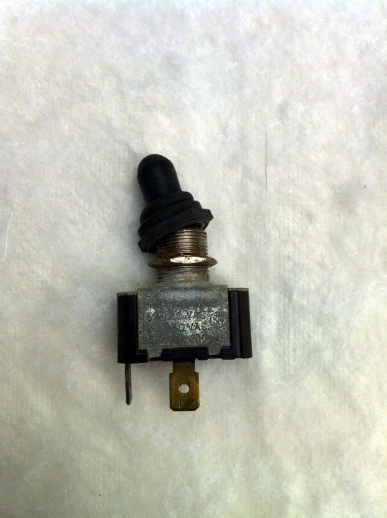 Original switch and inidicator panel off of a 1983 Stinger 312. All indicator lights work. Screw hole in upper left hand corner has cracked off. 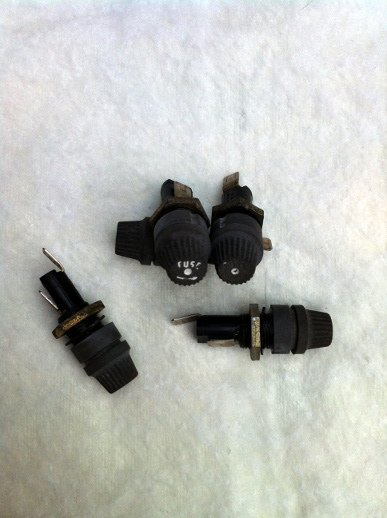 All indicator lights are in working condition. Comes with all switches and fuses. 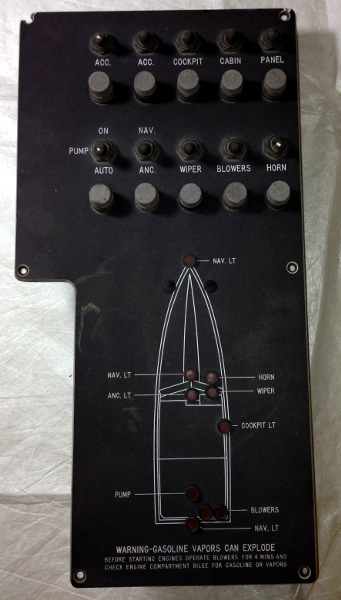 Original ignition panel from a 1984 Chris Craft 260 Stinger. This is a used item that shows some wear. 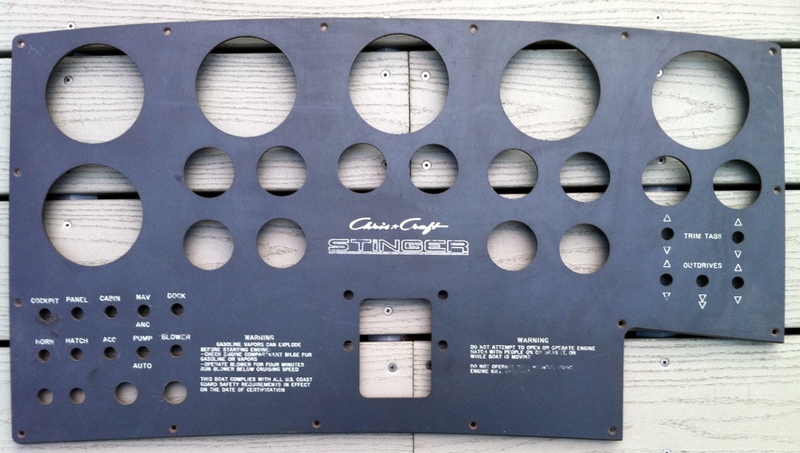 Original gauge panel from a 1984 Chris Craft 260 Stinger. This is a used item that shows some wear. Original dashboard for a Chris Craft 375 or 385 Stinger. This is a used item in good condition that shows some wear. Some of the lettering is rubbed off, and it has slight scratches. All of the inlaid mounting screws on the back are intact. There are no chips along the beveled edges. 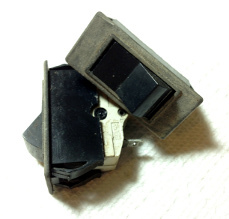 Trim switch used on trim panel for various Stinger models. This item came off of a 1986 260 Stinger and shows some signs of wear. On the side the switch is marked with 10A/250VAC 15A/125VAC 3/4PH 125-240VAC. On/off panel switch used on switch panel for various Stinger models. 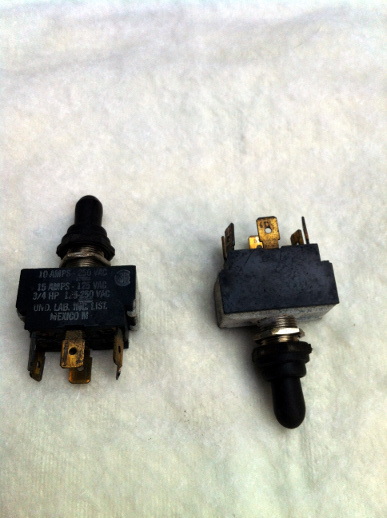 These switches were used to to control the wipers, blowers, panel/cabin/cockpit lights and accessories. This is a used items that came off of a 1986 260 Stinger and shows some wear, including missing or torn boot. On/off/on panel switch used on switch panel for various Stinger models. 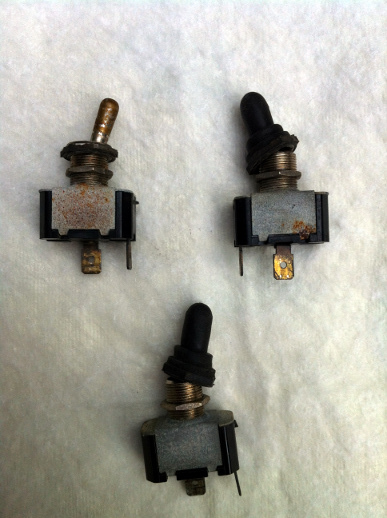 These switches were used to to control the bilge pump and navigation/anchor lights. This is a used items that came off of a 1986 260 Stinger and shows some wear, including missing or torn boot. Horn panel switch used on switch panel for various Stinger models. 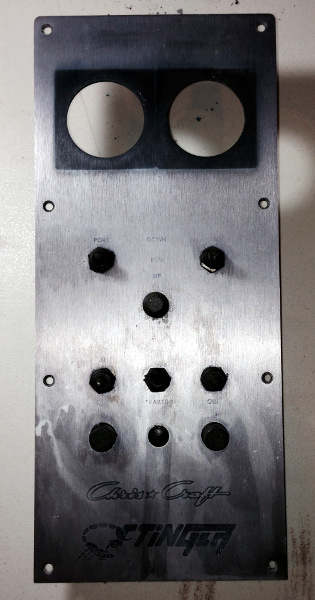 This switch was used to sound the horn and was located on the switch panel. This is a used items that came off of a 1986 260 Stinger and shows some wear, including missing or torn boot. 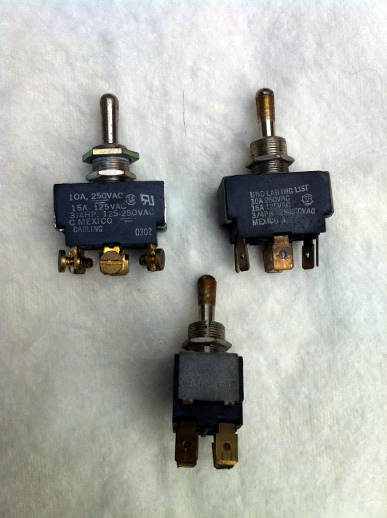 Rocker panel switch used on various Stinger models - These switches were used to control the navigation lights, bilge pump and blowers, etc. This is a used items that came off of a 1986 202 Stinger and shows some wear. Have both the 3A VAC250 and 5A VAC250 available for sale. 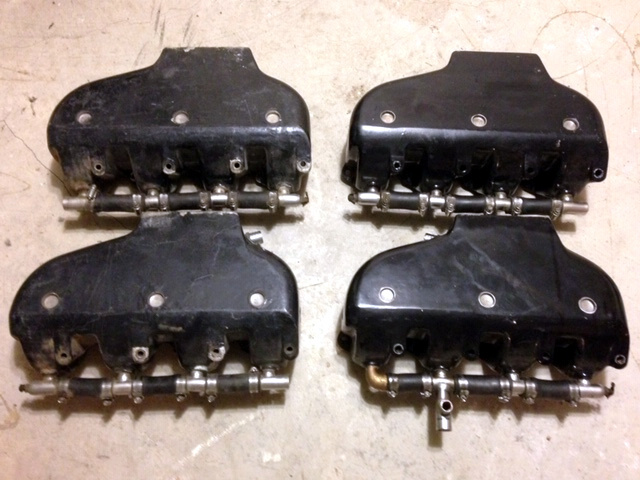 Fuse holders used on switch panels for various Stinger models. These are used items that came off of a Stinger and show some wear - including white paint worn away off of face. Rated for 20A 250V max. Teak trim off of a 1982 Chris Craft Stinger 390 X. Measures 44" in length, 1" wide and 1/2" thick. This trim was used to cover the chrome over the cuddy door hinge. 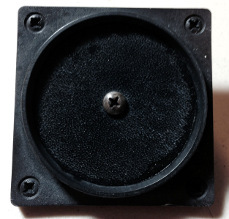 Has multiple screw holes for mounting. In very good condition - no scrapes or dents. 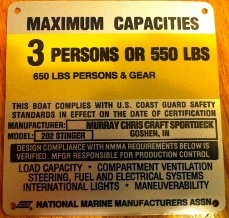 Metal capacity plate for a Chris Craft Stinger 202. Measures 4" x 4" square. Never installed on a boat. Factory original, new-old-stock item. Sitting in a box on a shelf for years. White Chris Craft Stinger decal. Letters are 19" long by 3.5" high. These stickers are originally from Chris Craft. Never been used. 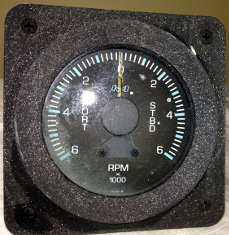 This is a working gauge that came out of a 1987 Chris Craft Stinger 260. The diameter of the gauge is about 3 1/2". This is a used item, and shows some signs of wear - some of the paint has come off of the brass bezel. It has a socket for a bulb but does not come with one. 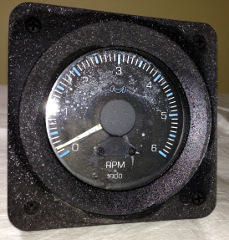 This is a working gauge that came out of a 1987 Chris Craft Stinger 260. The diameter of the gauge is about 2". On the back of the gauge are three flat contacts, one labeled +, the other labeled S or 5, and the last labeled ground. It is a used item and shows some signs of wear - some of the paint has come off of the brass bezel. It has a socket for a bulb but does not come with one. 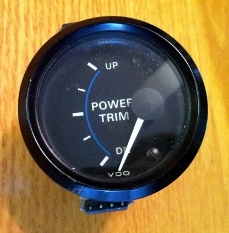 This is a working gauge that came out of a 1987 Chris Craft Stinger 260. The diameter of the gauge is about 2". It is a used item and shows some signs of wear - some of the paint has come off of the brass bezel. This is a working gauge that came out of a 1986 Chris Craft Stinger 222. The diameter of the gauge is about 2". It is a used item and shows some signs of wear - some of the paint has come off of the brass bezel. It includes the bulb for lighting the gauge. 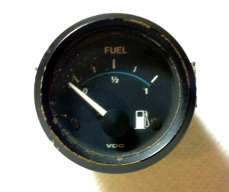 Teleflex fuel gauge used in some of the earlier Chris Craft Stingers. 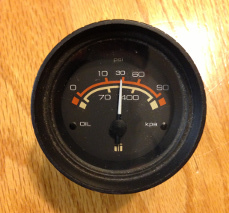 Teleflex oil pressure gauge used in some of the earlier Chris Craft Stingers. 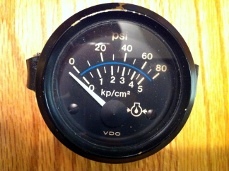 Teleflex engine PSI gauge of the type used in some of the earlier Chris Craft Stingers. 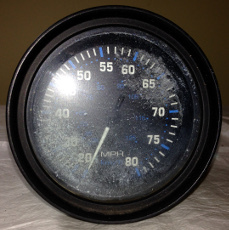 Teleflex speedometer of the type used in some of the earlier Chris Craft Stingers. 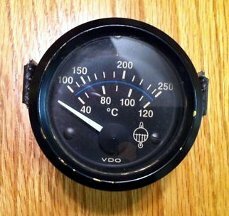 Teleflex temperature gauge of the type used in some of the earlier Chris Craft Stingers. Teleflex volts gauge of the type used in some of the earlier Chris-Craft Stingers. 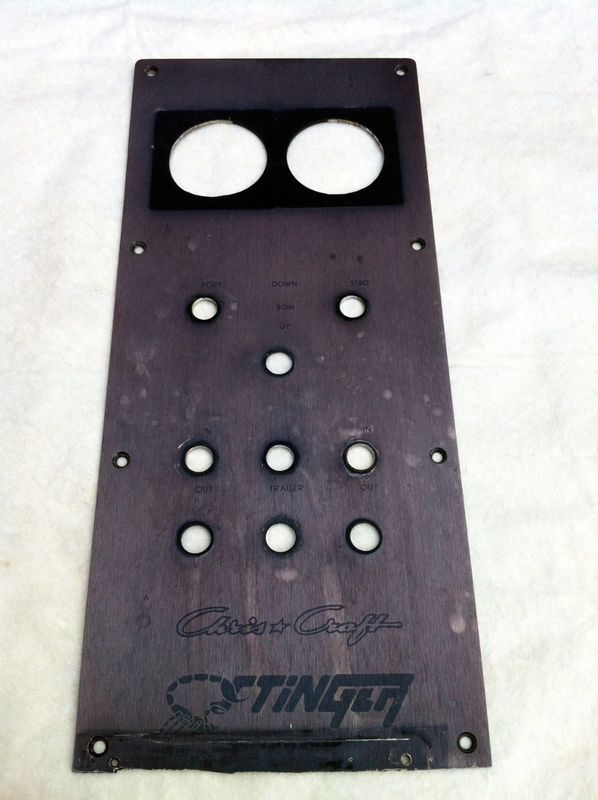 Teleflex blank panel insert used in some of the earlier Chris-Craft Stingers. 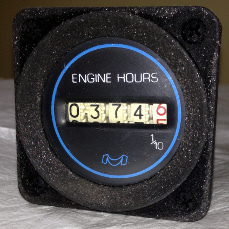 Medallion lighted engine hour gauge used in some of the earlier Chris-Craft Stingers. 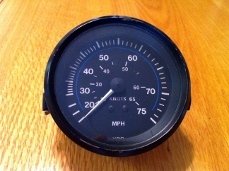 Medallion speedometer used in some of the earlier Chris-Craft Stingers. Inside of clear plastic cover shows heavy corrosion. 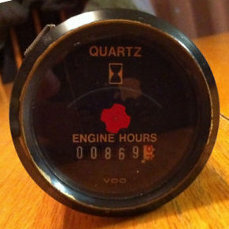 Medallion tachometer used in some of the earlier Chris-Craft Stingers. Gauge has corrosion on face. Medallion engine synchronizer gauge used in some of the earlier Chris-Craft Stingers. Inside of plastic face has some corrosion. 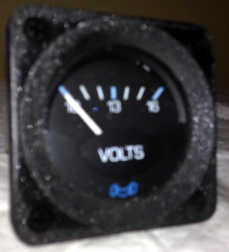 Medallion lighted volts gauge used in some of the earlier Chris-Craft Stingers. 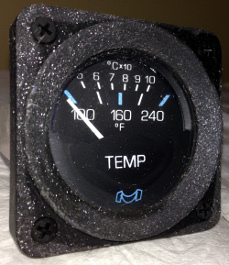 Medallion lighted temperature gauge used in some of the earlier Chris-Craft Stingers. 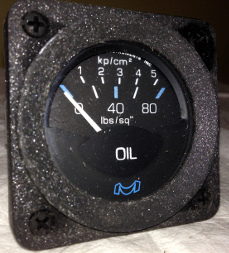 Medallion lighted oil pressure gauge used in some of the earlier Chris-Craft Stingers. 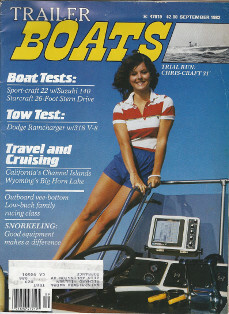 Chris-Craft 1980 Sportboats Brochure. Includes the following models: 170SS, Scorpion 210S, Scorpion 210SL, Scorpion 211VF S/D, Scorpion 211VF O/B, Scorpion 230S, Scorpion 260SL, 310 Excalibur, 25 Catalina Express, 26 Corinthian and 28 Catalina Express. Includes a one page review of the Chris-Craft Excalibur 310. Front conver was shot on the Excalibur. Magazine is in OK condition - has mailing label on front, some rips on back cover. Pages are yellowing with age. Includes short, 1/2 page reviews on boats for 1983 including 260 SL Stinger, 312 SL Stinger, 390 X Stinger, 182 BR Scorpion, 183 S Scorpion, 183 SL Scorpion, 210 BR Scorpion, 210 S Scorpion, 210 SL Scorpion, 230 S Scorpion, 230 SL Scorpion, 264 AC Scorpion, 390 SL Scorpion, Viking 170 SC, Viking 170 Sprint, Viking 190 SI, Viking 190 SL, Viking 190 EL, and Viking 220 EL. Also includes a Chris-Craft full page advertisement that has a picture of a Stinger 260 SL, Scorpion 390 SL and two other boats. Magazine is in rough shape with small tears on cover and pages. Includes "A Scorpion with Some Sting" - a six page review of the 1983 390 X. Review includes article, comments from testers (including Bob Nordskog) and performance data sheet.